Are you looking to add more multicultural books to your elementary or middle school library? This one has it all! It's set in both China and the USA, has Chinese and American characters, deals with birth defects and disability sensitively and realistically, AND it's illustrated free-verse. My students recommended this one to me, and I wasn't disappointed. Red Butterfly probably won't fly off the library shelves, but those who do take a chance on it will love it. Sensitive readers who love books like Counting By Sevens or Rain Reign will especially love this one. SUMMARY: Kara never met her birth mother. Abandoned as an infant, she was taken in by an American woman living in China. Now eleven, Kara spends most of her time in their apartment, wondering why she and Mama cannot leave the city of Tianjin and go live with Daddy in Montana. 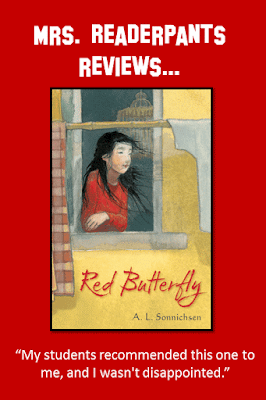 REVIEW: I read Red Butterfly because it was a Battle of the Books selection for this school year. I have to say that I wasn't excited about reading this one, but my students seemed to like it pretty well. 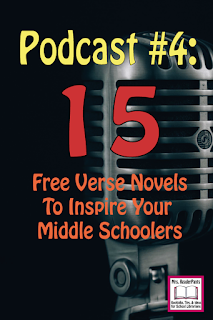 For me, it started a bit slowly, but once I got into the story, I was hooked. This is told in three parts. The first part is when Kara lives with her American adoptive mother in Tianjin, China. Kara and her mother live in extreme poverty and have no income at all other than what Kara's father sends them from Montana, which isn't ever enough. Kara's mother doesn't leave their apartment very often, and Kara does not attend school in China. As a result, Kara speaks English, not Chinese. As the story continues, we find out that Kara was never adopted legally; rather, she was an abandoned baby found by an American woman who decided to keep the baby. This causes lots of problems that Kara does not understand, including the expired status of her American mother's Chinese visa. The second section is set in a Chinese orphanage, particularly in the separate section of the orphanage that is for disabled children. Because Kara's arm and hand are not fully formed, Kara is put into this section of the orphanage. There, Kara works with and helps other children who have spinal bifida, cleft palate, and cerebral palsy. This was my favorite section of the book and gave me a lot of material to discuss with my students. We had an entire Battle of the Books meeting where we discussed the nature of these disabilities and the prognosis for children who have them. The third part is set in Tampa, Florida, where Kara is sent to live with a new adoptive family. This section deals with Kara's adjustment as part of a large, loud new family. She still longs to be with her mother, whom she has not seen since Chinese authorities took Kara to the orphanage. Don't miss the Author's Note at the end, where the author (a former USA expat living in China) describes her own experience volunteering in a Chinese orphanage. It's absolutely heartbreaking, but it was a life-changing moment for the author. THE BOTTOM LINE: If you are looking for stories set in other countries or featuring multicultural and/or disabled characters, this is a great choice. Red Butterfly is an engaging free-verse story that will give students a glimpse of the lives of disabled children living in a Chinese orphanage. STATUS IN MY LIBRARY: We have it, and since it was a Battle of the Books title this year, it is a popular choice among our two BB teams. Overall reception of this book from my 12 BB students has been positive. It's been among their favorite choices.